This revised and expanded edition of Tolkien's own Hobbit-inspired poetry includes previously unpublished poems and notes, and is beautifully illustrated by Narnia artist Pauline Baynes. 'Here is something that no devotee of the Hobbit epic can afford to miss, while awaiting a further instalment of the history of these fascinating people - a selection [of verses] offered as an 'interim report' to those interested in Hobbit-lore, and to any others who may find amusement in this mixed bag of old confections.' 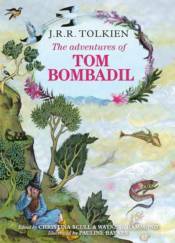 One of the most intriguing characters in The Lord of the Rings, the amusing and enigmatic Tom Bombadil, also appears in verses said to have been written by Hobbits and preserved in the 'Red Book' with stories of Bilbo and Frodo Baggins and their friends. The Adventures of Tom Bombadil collects these and other poems, mainly concerned with legends and jests of the Shire at the end of the Third Age. This special edition has been expanded to include earlier versions of some of Tolkien's poems, a fragment of a prose story with Tom Bombadil, and comprehensive notes by acclaimed Tolkien scholars Christina Scull and Wayne G. Hammond.